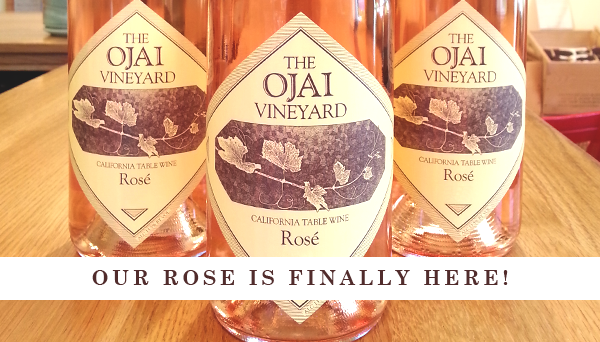 The Ojai Vineyard » February 11th 2016 ROSÉ Release! February 11th 2016 ROSÉ Release! Join Saturday Feb. 11 from 5 to 8pm to celebrate the release of our 2016 Rose! Rosé has finally caught on in America! For years, we couldn’t give away dry and delicious Rosé; no matter what we said, people were convinced it was sweet and bad. But times have changed, and last year sales were so brisk that we ran out before the first day of summer. Based on the deliciousness of this 2016, we won’t have it even that long. Of course, one of the reasons our Rosé is in such demand has to do with the fact that, like all our wines, we take Rosé seriously. It starts in the vineyard, where we choose interesting Rhône varietals and grow them specifically for Rosé. Those grapes: Syrah, Grenache, Carignan, Counoise and Cinsault are harvested at optimal ripeness to make a balanced and food friendly wine. Then, in the winery we treat the grapes much like the white wine varietals we make, gently whole cluster pressing the fruit and then fermenting and aging it in small French oak barrels. Shortly before bottling we add a small amount of Riesling and Sauvignon Blanc to the blend, which gives it a pleasant aromatic lift. Much like last year’s Rosé, the use of Carignan, Counoise and Cinsault gave us a wine of great savory deliciousness. Don’t even think about hesitating to buy this beauty, it will be gone in a blink!